The Eiffel Tower is safe and sound. The Eiffel Tower caught on fire the other day. It was really no big deal. 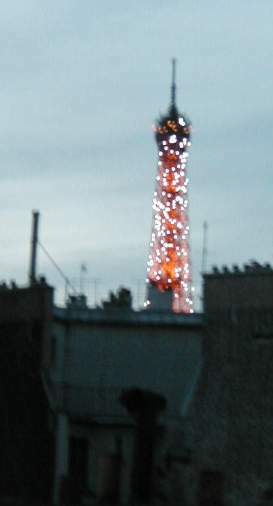 A telecommunications device attached to the tower just below its uppermost level had some kind of electrical crisis. The tower was evacuated, and tourists were frightened. But everything is back to normal now. The tower sparkles at night, and everyone is enchanted. France attempted to do something for Ingrid Betancourt (see the entry for July 8) recently, but it isn't entirely clear what that was. A Brazilian weekly called "Carta Capital" recently published an article claiming that a French plane containing arms destined for the leftist guerrilla group that kidnapped Ingrid was found in the Amazon forest. There were a number of French people with diplomatic passports with the plane, and they refused to let the Brazilian forces on the plane to inspect it. The Frenchmen invoked their diplomatic immunity and said, "Mais non!" At any rate, because the Brazilians made such a stink about it, the mission was abandoned. Nicolas Sarkozy (France's minister of the interior) happened to be in Colombia for the signing of a Franco-Colombian agreement on controlling the cocaine traffic said that the plane had a medical mission, and did not contain arms for the rebels. Flowers on our balcony, at about 10PM last night. There has been some indication that Ingrid, and perhaps some other hostages, are ill. The rebels may have allowed the plane to enter their territory to provide medical care to the hostage(s), but the publicity put an end to any attempt to do so. When the rebels get publicity they don't like, the Betancourt family explained, they often respond by killing some hostages. Gee thanks, Brazil. I guess Brazil was just miffed because they'd not been informed of the mission. Tuesday evening, we made it home after dinner in time to see our favorite French TV show, La Carte aux trésors. 4 million other people in France were doing the same thing. This week's show consisted of adventures in Maine-et-Loire. We saw chateaus and villages that most tourists don't go to. Well, they will now. The papers confirm what I have sensed: Lance Armstrong, who was disliked by the French just a year or two ago, is now very popular. They like him better because they think he's more human this year. Do the French like weakness and detest formidable strength? Some of Lance's former trainers say that he does show signs of aging this year. Lance himself has said that he's had a lot of trouble this year, and he hasn't felt right. But he is in good form this week. 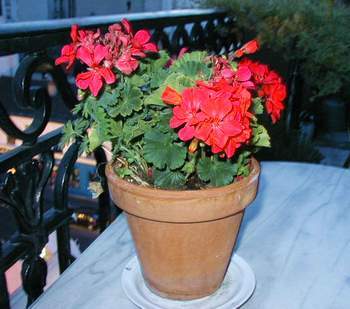 Geranium on the balcony at 10PM last night. The basketball player Tony Parker met Lance the other day. Tony is also extremely popular in France this year. And, guess who the French also love? Hillary Clinton. They adore her. According to the newspaper Metro, some right wing talk show commentator said a while ago that he'd eat his shoe if Hillary sold more than 3,000 copies of her new book. Well, she's sold more than a million in three weeks. While she was in Europe recently, she ordered a chocolate shoe to be made and sent to this commentator. The writer for the Metro said this showed her humorous and compassionate sides. Madame Chirac was enthusiastically complimentary about Hillary, and Hillary said that Madame Chirac is very nice, but Hillary is sure that during her next campaign, her enemies will use Madame Chirac's words to affirm that Hillary is supported buy the French. 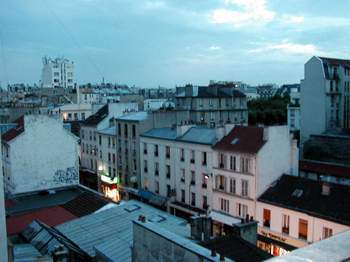 When I sit on the balcony in the evening, I look in the distance and when I see a window glittering (see middle of small pic at left), I know that the Eiffel Tower is sparkling, as she does during the first ten minutes of each hour after dark until 2:10AM. I go to the back windows and watch. View from the balcony at 10PM last night. 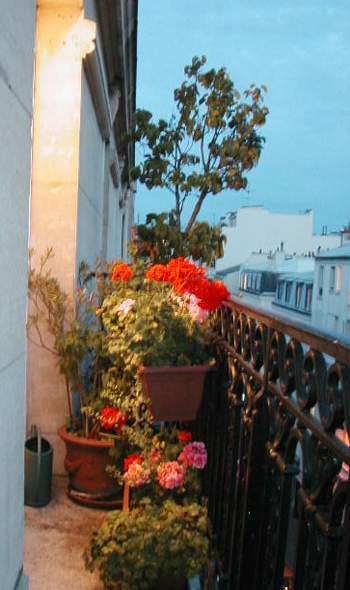 Then I return to the balcony, where I have this lovely evening view. Lots of French people would take a time like that for smoking a cigarette. But according to the Centre de Documentation et d'Information sur le Tabac, the French are consuming less tobacco. For the first half of this year, the French consumed only 40,583 tons of the carcinogenic stuff, compared to 43,684 tons in the same time period last year. The French cigarette manufacturer, Altadis, foresees laying off 533 workers in France and 743 in Spain. A cigarette factory in Lille will close at the end of August 2005. And a small one in Morlaix will close at the end of August 2004. 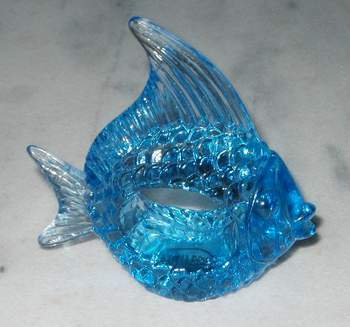 Fish napkin ring on the balcony at 10PM last night. In France, a pack of cigarettes now costs about 3.9 euros, due to tax increases. Spain has the cheapest cigarettes in the EU, at 2.50 euros per pack. France is suffering from a lack of lifeguards this summer. There are more pools and beaches than ever, and only 5,000 lifeguards. The French term for lifeguards, by the way, is "Maitres naugeurs-sauveteurs," or "MNS" for short. An MNS in France is paid anywhere from 990 to 219 euros per month (net), if he/she works 35 hours per week. To qualify for this work, one must have a brevet d'Etat d'educateur sportif option activites de natation (BEESAN) and a brevet national de secourisme (BNS). One must also have a brevet national de securite et sauvetage aquatique (BNSSA). Source: Metro, July 24, 2003, p. 11. I kid you not. 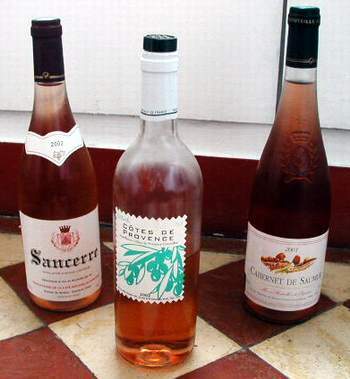 Three types of rosé, Sancere, Cotes de Provence, and Saumur. In the summer, the demand for rosé wine in France swells. The French rosé wine is much better than American rosé. It is drier, and MUCH more interesting. According to a July 19 article in Le Parisien, the demand for this type of wine goes up when it is hot. And they think it is hot now. There are basically two ways to make rosé. The grapes used are those that are used to make red wine. For the paler rosés, the grapes are put through a pressoir to remove the skins at the beginning of the process. For the slightly more colored rosés, the grapes are stomped upon and allowed to soak for only a short time. Then the juice is allowed to ferment. But these wines don't have to age very much. They generally don't cost much at all. The cheapest one here (in the middle) is only 3 or 4 euros. But you can find them for 1.9 euros in the grocery. The most expensive is the Sancerre, on the left, at about 12 euros. I've been experimenting with these and find them to be very quenching in this warm, dry summer weather. 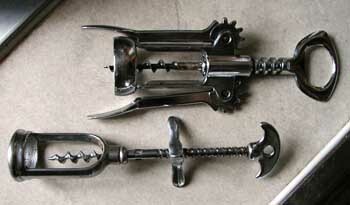 A "tire bouchon" is a corkscrew, or, more literally, a cork puller. Dinner last night was at Le Tire Bouchon. Feeling adventurous, I ordered ray. That's right -- as in sting ray. It came in the form of a terrine, served with a sort of pesto, as an appetizer. Tom had a duo of foie gras for his appetizer. Ray is very good. Foie gras is better. For the main course, we each had slices of guinea fowl with shrimp. It came with a tomato tarte, done in such a way as to demonstrate beyond doubt that the tomato is indeed a fruit. It was superb. Guinea fowl, by the way, is tastier than either chicken or turkey. It is not gamey at all. Isabelle (co-proprietor) greeted us very warmly. She is in good spirits because her little children are at the grandparents' in Orleans. She looks very rested and happy; she definitely needed this break from mommyhood.